The hubbub of High Holidays preparations is in full swing – from polishing silver to formatting the schedule, practicing liturgy, checking the sound system to sermon writing. All my rabbinic friends and colleagues are bunkering down during this feverish month of Elul to create the most meaningful, beautiful and spiritual experience they can for their congregations. 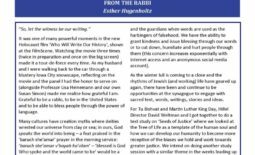 In terms of my rabbinate, I ‘came of age’ in the Internet era and can imagine that previous generations of rabbis in the pre-internet era would have felt far more isolated when it came to the unique features of this season. As we gear up, we know that we are going to come together as a community this coming Sunday night and I so look forward to it. The light will be mellow, the sanctuary will be full and both old friends and newcomers will enjoy the warmth of community. Yet, among all this busyness, it is easy to overlook the stillness and reverence of this Season. The High Holidays contain a multitude of paradoxes: music that speaks to the kishkes, that stirs the soul, and yet liturgy that affirm many ideas that most contemporary Jews cannot believe in. We come together searching for an experience that many of us would be hard-pressed to define and articulate. We want to be touched, moved and loved and yet the complex and deep questions that we live with every day keep our critical thinking abilities on the fore. We enter this space with our questions, our ambivalence, our joy but also our pain. And what are we supposed to make of all of this? How do we turn discomfort into questioning and questioning into curiosity and curiosity into transformation? Allow yourself to sit with the fullness of all those emotions, ranging from boredom to transcendence. Give yourself permission to be vulnerable, to hear the still small voice in the blast of the Shofar. The practice of saying Psalm 27 in Elul may give us some clues. 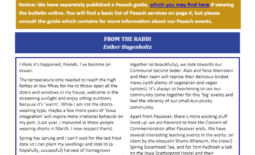 Elul, the month preceding Tishre, is marked by a number of spiritual practices to ‘ready’ our souls for the great inner work that we are called to do during this time. Traditionally, the shofar is blown daily and Psalm 27 is recited. For years now, I’ve pondered why this Psalm was chosen for the season of awe, and while I don’t have a hard-and-fast answer yet, I suspect it might have to do something with living our experiences through its words. Fear of abandonment and death, of broken relationships and interpersonal tensions. Yet also of hope and light, of equanimity, acceptance and joy. ‘Achat sha’alt me’et Adonai otah avakesh’ – we sing, ‘one thing I ask of You, Eternal One, one thing I seek ‘afer’. What’s the relationship between the request and the search? It’s personal accountability. Taking ownership and responsibility for our inner lives, this ‘bayit Adonai’, this House of God that the soul is believed to be. The High Holidays encourage us to find that inner sanctum, in spite (or maybe because of) the grandeur and drama of its rituals. To be able to ask – to admit to vulnerability, fallibility and need. To pursue something Greater than ourselves, despite our doubts and questioning. To be receptive: to the love of others, of self and, perhaps that of God. We are called to journey, to become uprooted and to come to a new place of understanding. 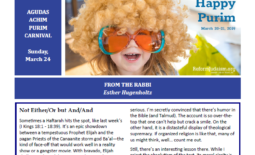 It is breaking these patterns that allow us to change, to repair relationships, to admit to our ﬂaws, and to work, as our Synagogue President Kathy Jacobs described so beautifully as a Mussar practitioner, on our ‘middot’, our virtues. The High Holidays is a model for us to undergo that process. As we enter the mellow light of our beautiful sanctuary, request one thing. Pursue one thing. Allow yourself to sit with the fullness of all those emotions, ranging from boredom to transcendence. Give yourself permission to be vulnerable, to hear the still small voice in the blast of the Shofar. Let the questions come in the safety of community and in the power of ancient ritual, even if we don’t always fully comprehend it. At the end of the day, like the Psalm itself states ‘chazak veyamatz libech’ – ‘be strong and let your heart take courage’. Our tradition is an optimistic one. We can change, we can repair, we can question and renew our days as of old. Each and everyone of us is given another chance. My family and I look forward to celebrating this special season with all of you.